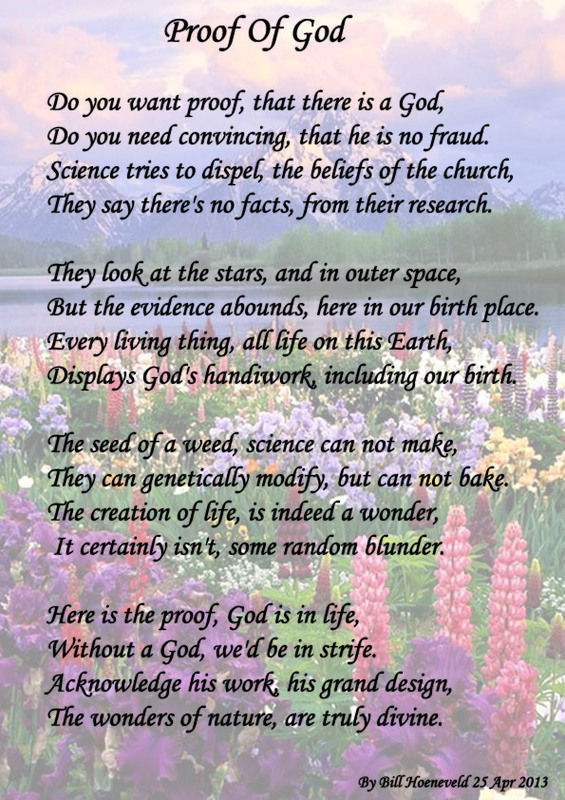 Atheists, what do you think of this poem? Update: I see some confusion here, I'm not the writer of it, I'm an Atheist in fact. Best Answer: It's poorly written and the writer doesn't seem to understand the meaning of some words he/she uses, like 'proof' for example. What do I think of that poem. Badly written with a childish rhyme scheme. The quality of a greeting card at best. An excellent example of why I dislike poetry so much. Only at its highest levels is it worth reading and this it is not. If your asking what I think of the content..eh at the same philosophical level as its poetry. Obviously not thought through and with obvious poor word choices. Or if you prefer..Very Good if written by a third grader. though the part about evidence being here is correct :D though not in the sense the writer means. How is this proof? Nature abounds - germs are born and multiply and so too do many other animals who nothing about your god. well i'm not atheist...... very nice one robert!! Help with an atheist poem......? Help with my lil' atheist poem? What do you think of this atheist poem? Here is my Atheist Poem. How do you like it? ATHEIST POEM version 3: Does this poem melt your icy cold atheist heart? Do you accept Jesus now? What does his body language suggest in this photo?